Nature - you are beauty profound! How enchantingly art thou drest! Blinding rage, tears you asunder! Ne'er shall you be the human's game! Beseech thee - pardon our blunder. We promise, O Gaea - we care. That was my first attempt at a style known as the retourne. Like so many other French forms, the retourne (from the French word, retourner - to return) is all about repetition. A retourne is comprised of four quatrains (four-line stanzas), and each line has eight syllables. The pattern goes like this - the second line of the first stanza must be the first line of the second stanza. The third line of the first stanza should be the first line of the third stanza. Likewise, the fourth line of the first stanza must be the first line of the fourth stanza. Thank you for the kind words, bro'... And yes, I am waiting for you to write one, next! Good luck! While reading I could notice the pattern but I didn't know it was retourne.. Different from what you usually read. PS: I didn't know the first comment is supposed to rip apart the authors work..
Too kind. :) Now u have something to think of for your next post! me is all smart, cute, lovely and lots more! Thanks for the read, bro'..! more than the poem your comments section was so interesting..
ofcourse your poem left me speechless.. it is so soulful.. i love nature and you made me fall in love all over again. i loved the post! !nature makes man humble..
i come here and i feel like strangling you until you die. i m never too busy to come here when i see my blog update me about you! dude this is awesome. i mean what do you do when you are not doing anything or vice versa? Nice, and i learned something new too! hmm. will sure have my take on this one soon. I kinda lack the ability to rhyme poems, most of the times they dont rhyme, so technically i envy, with a slight hint of wonder, people who can rhyme. and that also includes you. to the poem, well yesthere is a divine hand we can see all there :) I love nature, I like to write about it, ponder over it and enjoy it, hence i liked it immensely. That was beautiful man... and the pattern certainly was interesting. I like nature poems, but it's kinda sad that I've lost that penchant for writing them myself. Too good, boss! Too good... Keep 'em coming! Beautiful images, lovely retourne and thanks for the 'lesson' in poetry - very well stated. Most of the times when I read poetry I have felt the rhyming is done for the sake of rhyming. Well I would say I didn't feel that way about these lines...The flow was very good.. The last four lines...were superb. 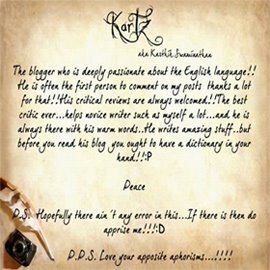 have tried writing a fictional piece :P.
Hey Kartz, this is super fabulous! Thanks for coming up with something interesting like this! I am gonna write a "Retourne" pretty soon! interesting style dude. and nice to see that uve taken pains to find out what the style was called..
**i m never too busy to come here when i see my blog update me about you! **i mean what do you do when you are not doing anything or vice versa? And ummm, readers such as yourself make this space lovelier. Thank you for the kind words, ma'am! Well, things are made lovelier thanks to readers such as yourself. Good to see u back, mate. How are you these days? Waiting to see your attempt at a retourne sometime soon, bro'. Its so good to learn new styles of writing.. Very nice..
as usual... rich verses and beautiful flow... !!! i bow to thee...!! I really wish u leave behind some contact detail... Thanks for the read. checked one of ur older ones too - fall of the keeper; TFT, rite? Retourne is a different style altogether. I liked it-it was unusual. But,[and this is not criticism but my personal opinion],I prefered your poem about Mother Earth-''Gaia'' more. msg beautifully put across! keep writing! Thanks for stopping by... Yes, it was from TFT. Huge WarCraft fan, here. Thanks... And I see another G-Arena WoW/TFT/DoTA visitor..??? Loved it Kartz. This is the first time I've ever come across a retourne. U did very well too! I loved the technical aspect of the poem, but it hardly made me feel, it kind of shut out the reader. Maybe that's because I'm a lousy reader, but a poet should make a lousy reader feel too. ahaaa...a nice attempt...i am trying form poetry as wel..
tht was darn nice, matey... keep writing! Merci beaucoup, mademoiselle. Je suis tres content! Bienvenue à Contorted Reality... I appreciate your time to drop-in and leave a note. Peace. Have an nice day. Do you mean to say that it was running dry..? Or something like that..? Thank you for the read. I assure you that it wasn't lousy. Welcome to Contorted Reality. I appreciate your time and your readership. Thank you for stopping-by to leave a note. I appreciate your time and your readership. but i liked what i read. this is wat i was trying to remember !! i read this one n noted to myself to try this !! but was in a hurry so forgot :( did not even commnet ! sowie !! this was really beautiful :) will try it soon ! hmmm..u r a polyglot alright! we could put it up for Earth day! i will give it a shot too sometime soon..thanks for sharing this, Kartz !! 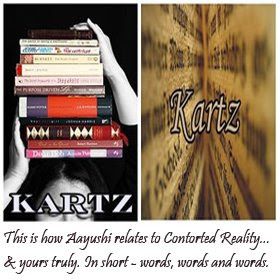 Welcome to Contorted Reality. I appreciate your time and hope to see you more often. Yes, I am a polyglot. Thank you for the read. And oh yes, Earth Day here I come! hey i suggestion .. do link the source of ur knowledge wen u try a new poem form .. i wanted to copy the rules for later use but cud not and den i had to search in google so much for it !! Attempted : "Why did I?" Welcome to Contorted Reality. I appreciate your time to stop-by and leave a note. Noted. And the reason why you could not copy is because I have disabled text-selection. Sorry for the inconvenience. On it. Thank you for the update. Thanks for the read. I value your opinion. A decently good effort! Keep at it!! !